Listen to the podcast. Find it on iTunes/iPod and Podcast.com. Read a full transcript or download a copy. Sponsor: VMware. Our next VMworld case study interview takes aim at ADP Dealer Services and details how they're benefiting from expanding use of desktop virtualization. We'll learn about how ADP Dealer Services is enjoying increased security, better management, and higher productivity benefits as they leverage desktop virtualization across their applications development activities. 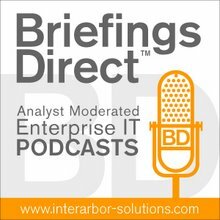 This story comes as part of a special BriefingsDirect podcast series from the VMworld 2011 Conference in Las Vegas the week of August 29. The series explores the latest in cloud computing and virtualization infrastructure developments. Gardner: Why have you pursued desktop virtualization for application development first? Naughton: We had an interesting problem to solve. The first issue was developer productivity, which is very important to us, because we do have a big software development engineering house that needs to be productive. And we had issues where our traditional approach of putting them on the user based plan was not giving them the creativity, flexibility, and productivity they needed to spin up new environments, to have a free workspace so they could do what they needed to create products. So we thought that a VDI solution, combined with a quick provisioning and deprovisioning for development environments, would make them more productive and protect their normal day-to-day use of email, ERPF, Salesforce automation apps that they might need on the traditional production environment. It's been now going on for probably about a year-and-a-half. We were looking at what was the right design and what was the process, because there is a lot of process involved with change management, with the provisioning and deprovisioning. So we did some pilots and now we're in full roll out and pretty excited about the results. We're talking over 1,000 technical people who will use the solution -- software engineers, QA type people, test people. And because ADP Dealer Services has a pretty big application portfolio, we're talking about hundreds of environments, thousands of servers that have kind of grown up over the years that support our R&D environment. Gardner: What does ADP Dealer Services do that relies to heavily on software development prowess? Naughton: ADP is the world’s largest outsourced human resources, payroll, and tax benefits company started in 1949. It's about a $10 billion company, with 50,000 employees and close to 600,000 clients. It's one of Fortune’s most admired companies and one of only four companies with a AAA credit rating from Moody’s and Standard & Poor’s. ADP Dealer Services, is a division of ADP, about a $1.7 billion company that’s serving the auto retail client base throughout the globe. ADP Dealer Services, is a division of ADP, about a $1.7 billion company that’s serving the auto retail client base throughout the globe. It has about 8,000 employees and 25,000 clients to serve through software and services the auto retail and the OEM auto manufacturing industry. Gardner: So I imagine that the applications that you are creating for these dealers are very intensive in terms of data, and many different types of applications, custom apps, as well as more off-the-shelf or third-party, need to be integrated, so a fairly complex set. Naughton: It's a very complicated set. You are right on the money. It's all the way from ERP systems that we develop for the industry, CRM applications, digital marketing applications, all the way to the telephony side of the business. So there is hardware integration, third party integration, but it’s mostly ground-up software development that is the core base of the business of cloud computing apps, multi-tenant applications, and then applications that will tie into telephony systems and other applications through APIs. But the core products are ground-up software development. Gardner: So it's a highly technical undertaking and your developers are really on the front lines of making this business work for you. This isn’t a nice to have. This is mission critical across the board? Naughton: Absolutely. And you want to make sure the developers have as much creativity and freedom as they can possibly have. At the same time, ADP being a public company and being a company that people entrust the data with, we need to have good security across our different platforms. So the challenge was to give the developers a platform where they could be creative, where they could be given a wide range of latitude of tools and technology and at the same time, protect their day-to-day compute that they needed for things like messaging or applications the managers need to administer the workforce. Gardner: Bill, as CIO, you had this vision about how to empower and enable your developers, perhaps even cut some costs along the way, I can imagine that you went to Shane and said, "Make it happen." Is that how it happened or did Shane come to you and say, "Listen, I've got this great idea?" Naughton: It was a joint effort between knowing that we wanted to do something different, knowing that the developers had unique needs, knowing that security had definite requirements on how we protect from malware, how we protect from viruses, how do we patch and protect the environments. And then we had a cost consideration too in that the spiral of development that we provide to the CTO in his office was getting quite big. So the combination of Shane being forward-looking at a solution, the requirements we had from the development community, and the security requirements from our GSO office brought it all together into something where we're going to try something a little bit different than traditional approaches. There's been a tremendous consumption. The adoption by the associate community has been wonderful. Gardner: Shane, how has this impacted you from the infrastructure point of view? Martinez: There's been a tremendous consumption. The adoption by the associate community has been wonderful. We were faced with a challenge where we had to present the development community with an environment, which as Bill mentioned, had the latitude for them to perform their job function and they could be creative again. They were re-empowered to do their job and had all of the operational benefits that a typical compute would give them. In addition to just that environment flexibility, also with the VDI View infrastructure, we were able to provide them with compute environment that was more specifically designed to meet their needs. As Bill mentioned, we have a litany of different applications and development communities, and each one of their specific compute requirements are different. Using a technology like View that allows us to abstract from the hardware, we create infrastructure specific to each one of their needs. There was a complex challenge that obviously we had to overcome, which was how do we present this pretty powerful environment and construct to people who are distributed, not just across the continental United States, but globally. By creating a separate VRF instance in our wide area network, we were able to bifurcate our WAN and create two discrete networks. That second network, which effectively became a shadow of our production infrastructure, is where the VDIs and all of our lab environments live. As Bill said, that separate environment is one that is specifically designed to meet the needs of our development community. By virtue of having VDI and View out there for them to access over the separate network, they then can reach it from anywhere within our global network. So we have associates that are distributed across all of our sites that have the ability to consume these resources that we made available. Gardner: And they have been mostly happy with the latency issues and performance? Martinez: Oh, very pleased. As a matter of fact, there are several different ways in which we allow them to consume it. The first one is they can access the assets direct. With the View client, they can access their remote workstation and work on it however they are comfortable with. In addition, though, we have the ability for them to check out that workstation and they can use that workstation either locally or when they are remote on the road. They can use that on their assets and then come back in and check it back in the library. It works very well for them. There are two great benefits. The first thing is, from an administrative standpoint, just purely the FTE consumption. I have a very small staff that is designed to manage this specific environment. Currently, we're managing 300-400 workstations per administrator. So we get a very high level of density to associate from a support standpoint. In addition, we can create and deploy workstations exceedingly fast, at a rate some days of up to 50 and 60 a day. In addition to that, there's the server administration, as Bill mentioned, with Lab Manager and the accompanying technologies from VMware that we use. This small team is also able to manage in excess of 2,000 servers for the same group of developers and the development community. Naughton: It's really important that we try to provide a service to the development community that they send a case in and Shane’s team does the provisioning, deprovisioning for them. We spin the environments up real quick and deprovision and reclaim the space. So we get efficiency there. The service by the admin is taken care of -- the whole process that they need for new environments. You want to make sure the environments get taken care of. So they do both of that. There is a service component to it that we think is important. Gardner: You're referring here to your application development activities, but your R&D and lab, are they separate? Do they overlap? How does that work, and what have you been using to support them both with VDI? Martinez: There are two different environments, as Bill mentioned, throughout the lifecycle of creating a new product. Our development community has to obviously create code and write code, but as we become more of a cloud-based service provider to the auto, truck, marine industries that are out there in the world, we become more of that and interact with the Internet. So that lab, that test environment, needs to be very dynamic as we create new product, release it ,and have it interact with the Internet and some of the OEMs and external parties that have access to that. As a result of that, this environment also is able to provide us with a very secure, remote location that is separate from our ERP applications, our standalone Salesforce automation applications, etc., where we can have people connect and test product, beta product, alpha product even, in a place that poses no risk to the rest of our infrastructure. For all of their activities interacting with the lab, it stays contained in the lab, thus securing the rest of our infrastructure. As we as an organization continue to abstract our operating systems and the applications from the hardware that underlies it, it allows us to become more flexible in how we deliver compute, and application services, both to our internal associates as well as to our external clients. So ADP has undertaken a great deal of effort in order for it to create its own private cloud infrastructure and the View client and the vSphere environment really is an adjunct to that strategy. Gardner: All right. One other area that I've heard folks mention, when it comes to the benefit of more centralized control and management, is in the disaster recovery and business continuity aspects. Are you able to also feel lower risk in terms of how you can back up and maintain continuity regardless of external factors for both your application development activities as well as production? Martinez: Absolutely. By virtue of compressing a great deal of this very critical data and intellectual property into an environment that is virtualized and abstracted by virtue of all the benefits you get with just a virtual environment, vMotion, etc., our data and our environment are much more highly available. In addition, by virtue of the design, the way in which it’s architected, by bringing all this critical data together, we then can better manage it through a variety of ways that we manage our DR. However, this has really been the stepping stone for us to begin to compress and consolidate all of our distributed lab environments across the world. Gardner: It almost sounds like a snowball effect, the more you do this, the more you can avail it. The more you can avail it, the more you can apply it, and so on and so forth. Does that overstate in the case when it comes to virtualization? By virtue of the design, the way in which it’s architected, by bringing all this critical data together, we then can better manage it through a variety of ways that we manage our DR.
Naughton: No. Shane worked with some of the more forward-looking and toughest R&D owners we have -- Hamid Mirza, our CTO and Mark Rankin, the VP of Engineering for our core products, a person who has very demanding requirements -- and they started at the places where we felt we had the most benefit. So he has evangelized what we have done. That’s really helped with adoption across the business and it's really starting to gain momentum. Martinez: From a business standpoint we've stopped the technical infrastructure sprawl that we had in our lab environment. So we don’t see that. It was lots of small purchases for servers, for backup infrastructure, for commodity items. That has stopped. So there's a business benefit on just the rates of buying an infrastructure sprawl. The provisioning and deprovisioning has compressed the cycles that they have of the rote activity that we had in the past. Developing software is a complicated process. So we've automated the steps that we could through the provisioning and deprovisioning. In terms on all the connectivity challenges for developers, where they had to get to environments and the management of those environments, we have relieved the burden on that. They have the client, it spins up, and they are ready to go instantaneously, versus a lot of traversing and a lot of custom configurations just to get the environments to make a mark. Gardner: What’s the business payback for this so far? Naughton: This had an ROI, and sometimes the infrastructure on the ROIs are difficult because this is enabling technology. But it made our criteria that we have investment. So the ROI is pretty quick. We have certain criteria before we make any investment. This one fell right in line with it and it’s delivering what it’s supposed to. Gardner: Is there anything about what you've done with virtualization and desktop virtualization that you think might allow you to go out and bring your apps and business processes to a wider range of devices? Martinez: Absolutely. The environment has very powerfully allowed us to open up our compute activities at the end-user, associate level, so that they can consume applications that typically wouldn’t be available to them on a pad, tablet device, or even a smartphone. Now, by virtue of being able to access those particular workstations in that environment with the View client, they now can consume those applications that don’t have something specifically written for a tablet or a smartphone. So effectively, they use that remote View workstation as a jump post that allows them to interact with any application. So we are no longer bound by the restriction that a tablet or a smartphone may normally present our associates. With this View application, we can disconnect, check out a workstation, allow it to securely VPN in, and then interact with all of our applications in the infrastructure. In addition to that access, we're allowed to do it securely. Historically if you wanted to allow a tablet or a smartphone to interact with applications, you had to do so straight from the Internet. It was very difficult to do so unless the person was connected to your network. Now with this View application, we can disconnect, check out a workstation, allow it to securely VPN in, and then interact with all of our applications in the infrastructure, via a mechanism that the associate is comfortable with, and an interface that they have historically worked with. So our adoption rates have been very high. Naughton: What Shane is describing is for our internal users who need applications that we provide internally to our workforce. From product development side of the house, what’s been exciting about what we have put together is, as they have come up with mobile platforms, as they want to do native development, or they want to go to HTML5, this environment, we'll be able to scan up those environments for new technology for them to test and to write code against very quickly. In the past we would have to set up a mobile platform, set up a gateway, or put up an environment that would do native apps. What we have done here is allowed test, QA, and development very quickly for new technology like mobile, which is there in the midst, where we have actually put product in the marketplace, put mobile product out there against our core applications and we are able to spin up those environments very quickly. Gardner: Here at VMworld, we're hearing a lot about the new View 5.0. Do you have any impressions about anything in it in particular that’s enticing? Martinez: Some of the greatest benefits that we see coming down the pike from the new product releases is going to be specifically around the protocols it will support. I think that with some of the features and functionality that can be difficult over high latency links over a wide area network, with improved and tighter protocols, PC-over-IP as an example, the benefits to our associates will be huge. Some of the challenge is that when you abstract the associate locally from their interface, it can be the WAN, high latency links, etc. We have no challenges with this today, but I can see as we go into more and more remote markets, that we need to support third-world countries, where links can be exceedingly pricy or can be very poor in their quality, this will be a huge benefit to our associates. Naughton: Depending on where the profiling ends up, that’s also important, because as we get into different user bases in our associate community, profiles is going to be an important piece that will help with faster adoption and the ability to include more of our workforce up to a VDI solution. Some of the challenge is that when you abstract the associate locally from their interface, it can be the WAN, high latency links, etc. Gardner: Last question before we wrap up. I imagine too that your success in using VDI for application development is a harbinger of expanding this into other parts of ADP Dealer Services or maybe even ADP at large. Any thoughts about whether you're a proof point that others will look to in terms of taking VDI into even more of your organization? Naughton: At our payroll division in our corporate office they're looking at different solutions and have solutions in production for VDI. Obviously, the benefits of administrative productivity improvements with patching, deployment, roll outs, streaming applications, are all stuff that are exciting developments. We have probably gone deeper in our home shore, in our application development areas. But I think that there’s some pretty strong use cases where more of our transaction-based functions like customer support, internal sales, where they are high transaction volumes where a VDI solution would be very helpful.